- Excess baking powder or baking soda was used in the recipe. The solution to this would be to make sure the correct amount of raising agent is used as stated in the recipe. Also, if the recipe calls for self-rising flour, do not use any other raising agents in the recipe since the flour already contains them. - Another possible cause is over-mixed batter. If a recipe instructs you to cream your mixture for 3 minutes, make sure you follow instructions to the letter, do not mix for longer that instructed in the recipe. - Using a baking pan that is too small. The solution to this would be to use the correct baking pan stated in the recipe. If it's a 9" Round pan, make sure you use the same as stipulated or a different shape but still an equivalent size. - Batter was over mixed. It is very important in every recipe, to mix the batter as instructed, not more - not less. - Cake removed from the oven too soon can also cause sinking. 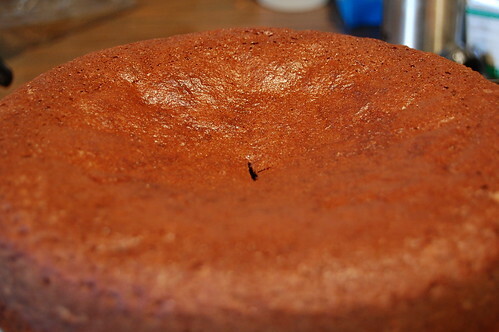 The solution is to make sure you follow the correct baking times and when in doubt, just insert a tooth pick in the center of the cake and if it comes out clean, remove from the oven. - Opening the oven door during baking. Make sure while you're baking, you don't peek, especially towards the end of baking time. - Oven too hot at the beginning of baking. Make sure you preheat your oven to the right temperature. Also if you can, purchase an oven thermometer for accurate measurement of the oven temperature. - Too much baking powder or baking soda. Make sure you use the correct measurements of raising agent as stated in the recipe. - This happens if the pan is not sufficiently greased and floured. Make sure you always grease and flour the baking pan before use. - If the cake is turned out of the pan immediately after baking, it sticks to the side of the pan and will leave parts of it in the pan.This can be avoided if after baking, allow the cake to cool for at least 5 minutes in the pan before removing it. - Cake cooled too long in the pan. To make sure cake doesn't stick to the baking pan, make sure after you cool the cake in the pan for at least 5 minutes; remove it and place the cake on a cooling rack. - Too much flour was used. Make sure you measure the flour appropriately with a measuring cup and follow recipe measurements of flour accurately. - Not enough liquid in the batter. To solve this problem, make sure you follow the recipe accurately and don't reduce the quantity of liquid stated in the recipe. This tips will help you avoid disastrous situations while baking. Enjoy your home baking ^_^! would like to talk jikos!